Guy Robertson and Andy Inglis pulled off one of the finest climbs of the season on March 18 when they made a first winter ascent based on The Chancel on Beinn a’Bhuird. This five pitch E1 on the West Face of Mitre Ridge was first climbed by Dave Nichols and Greg Strange in May 1978. It was originally graded HVS 5b, but an early repeat upped the grade to E1 5b. “Great day on Beinn a’Bhuird yesterday,” Guy told me. “Andy Inglis and I climbed The Chancel – first three pitches as for summer (second pitch the definite crux), then the obvious turfy winter line on the wall above the ledge (right of the summer line), then a finish up West Side Story to gain the top of the First Tower. Five superb pitches, and pretty good value at VIII,8. The climbing on the second pitch was comparable in style and difficulty to that found on the harder routes on Lochnagar’s Tough Brown Face, but with generally good protection. It really is such a joy to climb on this great cliff in winter – there are very few places like it for quality, scale, remoteness and commitment. We did quite well – with some quite challenging snow conditions out across the open moor – leaving the car just before first light and topping out on the route as the sun went down (and the moon came out). Nonetheless it was still an 18-hour day car-to-car – 22 if you include the driving and faffing! I was certainly glad of my double helping of pudding the night before, and I’ll be having puddings with my dinner for the remainder of this week! As Guy implies, winter climbing in Garbh Choire on Beinn a’Bhuird is a major undertaking. The corrie is ten miles from the road and one of the most remote in Scotland. A reconnaissance was made a week before, and the eventual ascent required many hours of trail breaking through deep snow. All round Scottish winter climbing adventures don’t come much bigger than this! 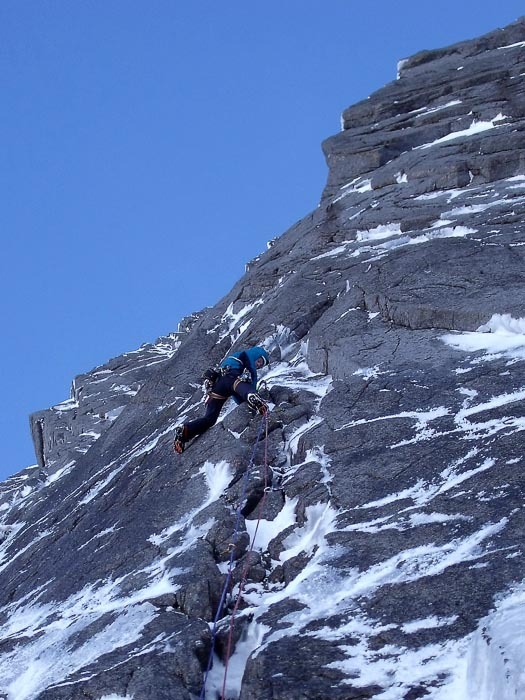 This entry was posted in New Routes and tagged Andy Inglis, Beinn a'Bhuird, Guy Robertson. Bookmark the permalink.